The advantage of RLL for actual reading skills [...] is strongly supported by the results of this study, especially for boys and at the end of Grade 2. (p. 49). As Jordan rushes to expand public kindergarten education, what about unregistered providers? This commentary post was originally published on the RTI.org "Insights" blog Reproduced with permission. In 2016, the Hashemite Kingdom of Jordan launched its new Human Resource Development (HRD) Strategy, which aims to achieve “talent-driven prosperity.” Early childhood education is a central pillar of that strategy, which mandates the universal provision of one year of kindergarten (the year immediately preceding first grade) by 2025, with simultaneous improvements in quality and accountability. This government mandate, while a step in the right direction towards achieving Sustainable Development Goal 4.2, begs the question: How many children are actually enrolled in kindergarten in Jordan, and to what extent do kindergarten services need to be expanded to achieve universal enrollment? Like many other countries, Jordan is committed to early childhood education but struggles to afford expanding public kindergarten services in a context of fiscal constraints in a sluggish economy. Jordan also faces the enormous burden of accommodating approximately 666,000 registered Syrian refugees, in addition to an unknown number who are unregistered. The former Minister of Education, Dr. Omar Razzaz—appointed as Prime Minister in June 2018—provided strong leadership for the kindergarten enrollment imperative. Recognizing the Ministry of Education’s (MoE’s) resource constraints, he asked the United States Agency for International Development (USAID) to help the MoE map the current provision of kindergarten to inform an exploration of potential public-private partnership strategies. The HRD Strategy emphasizes using partnerships between the MoE and other governmental and nongovernmental actors to assure expanded provision of kindergarten services. MoE data shows a current enrollment rate of 60 percent, which reflects both public kindergarten and registered private providers. However, anecdotal evidence and data from the Ministry of Social Development and Ministry of Islamic Affairs—both of which register charities and civil society organizations—suggest that there are many more providers of kindergarten services who are not licensed by the MoE. With the blessing of Minister Razzaz and funding from USAID, we set out to investigate.In late 2017, we conducted a national survey of the parents of children in grade 1, asking them about their children’s attendance of kindergarten the year before. We interviewed more than 10,000 parents, in a sample that is representative of all governorates in Jordan, in urban and rural areas. The results were startling: 84 percent of parents said that their child had attended kindergarten last year, much higher than the attendance rate captured in the national statistics. When only Jordanian parents are considered (excluding Syrians, Iraqis, and other nationalities), the enrollment rate shoots up to 92 percent. Parents also reported that they paid monthly fees for their children to attend kindergarten, with most paying between 11–30 JOD ($15–42 USD) per month. This data suggests that many children are attending kindergartens that are not licensed by the MoE and therefore are not counted in official enrollment statistics. So how do we square our findings with the national statistics? This data suggests that many children are attending kindergartens that are not licensed by the MoE and therefore are not counted in official enrollment statistics. Some of these providers are charities and civil society entities registered with other branches of the Jordanian government, but they are not licensed by the MoE to provide kindergarten services. Without supervision from the MoE, the quality of these unlicensed providers is unknown and likely variable. The data further suggests a very high demand for kindergarten services, such that many parents will pay for it if there is no free, easily accessible option. 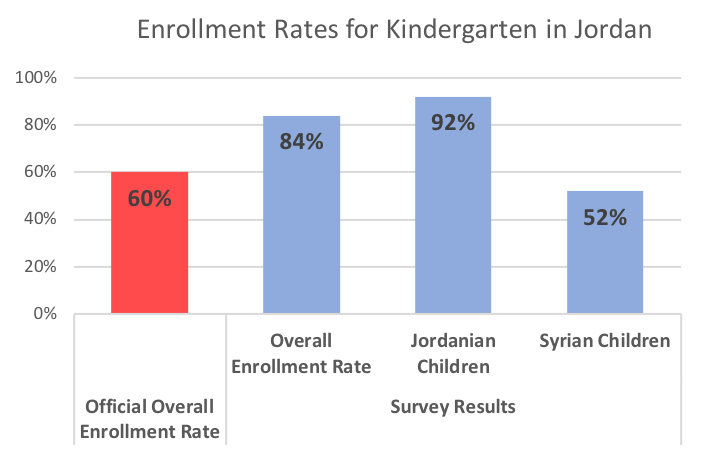 Clearly, a thriving market has developed in response to increased demand for kindergarten among parents in Jordan. - First, Jordan’s national education statistics are likely underestimating true enrollment in kindergarten. Therefore, policy and planning documents aimed at achieving universal enrollment are overestimating the degree of public-sector expansion needed to close the gap. This discrepancy also has implications for foreign assistance packages. - Second, the MoE needs to streamline and simplify its processes for engagement with private and civil society kindergarten providers. Why have these market actors chosen to operate under the radar? In Jordan, as in many countries, the transaction costs of interacting with the government are significant, especially for small organizations and individual entrepreneurs. In addition to the outright expense of obtaining a license, the process is cumbersome, involves numerous government entities, and imposes onerous requirements on kindergarten providers. - Third, Jordan and other governments should consider reframing the kindergarten access goal as a supervisory and regulatory responsibility for the government, rather than expecting the government to be the single provider of universal coverage. Just as at the primary level, in most countries, a policy of universal enrollment in basic education depends in part on a thriving market of private schools. For governments like Jordan that are struggling to expand kindergarten access, significant cost savings can be gained by partnering with the private sector. - Finally, important issues of quality and equity must be addressed in any strategy that relies on shared roles of the public and private sector. The government of Jordan has been successful in prioritizing free public kindergarten in rural and remote areas where private providers are less active. Determining how to ensure high-quality learning environments and incentivize provision to vulnerable and disadvantaged populations should be a top priority in Jordan and elsewhere. As countries around the world seek to expand access to preprimary education, these and other policy considerations are essential to ensure the most effective use of public resources in pursuit of quality kindergarten for all children.